Algerians Demand Resignation Of President Abdelaziz Bouteflika President Abdelaziz Bouteflika announced on Monday that he would not seek reelection to a fifth term. But Algerians are demanding that he resign immediately and not prolong his nearly 20-year rule. 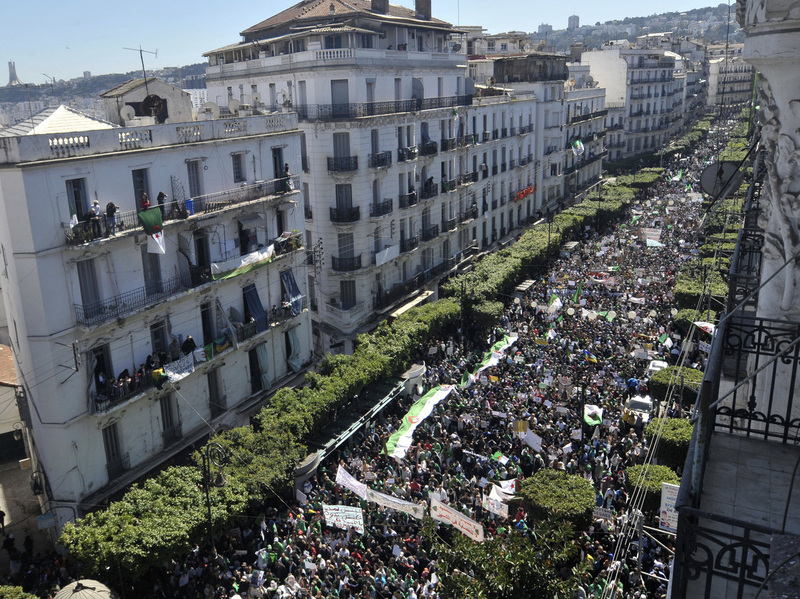 Algerians march during a protest in Algiers, Algeria, on Friday. 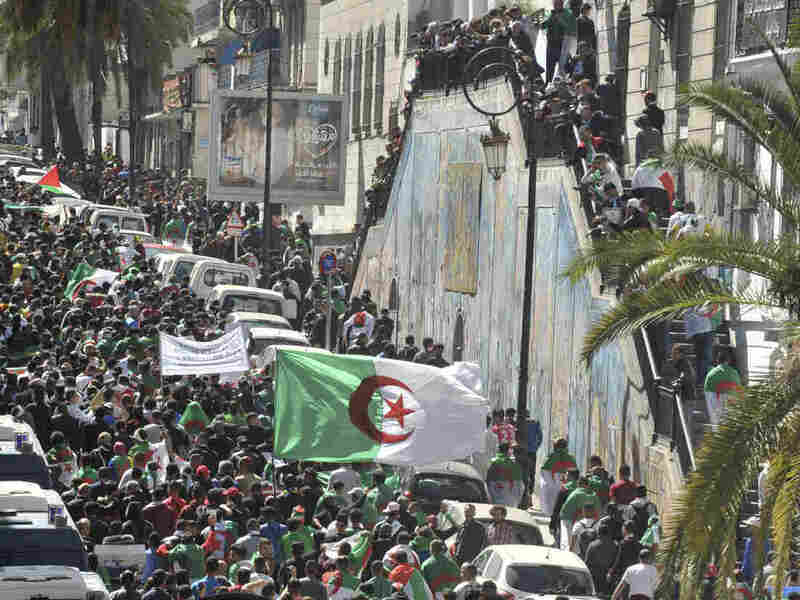 Demonstrators filled the packed streets of downtown Algiers, protesting for the fourth consecutive Friday, and calling for the immediate resignation of President Abdelaziz Bouteflika. On Monday, following weeks of demonstrations, the 82-year-old president bowed to public pressure and announced that he would not seek reelection to a fifth term, reversing his earlier decision and prompting Algiers to burst into celebration. But he also delayed the election that had been scheduled for April 18 without setting a new date, provoking suspicion that he intends to make symbolic concessions while extending his nearly 20-year rule indefinitely. In response to Bouteflika's decision, the chants protesting his bid for a fifth term have given way to calls that he hand over power immediately to a younger generation of leaders. "There won't be another minute, oh, Bouteflika," protesters chanted on Friday. 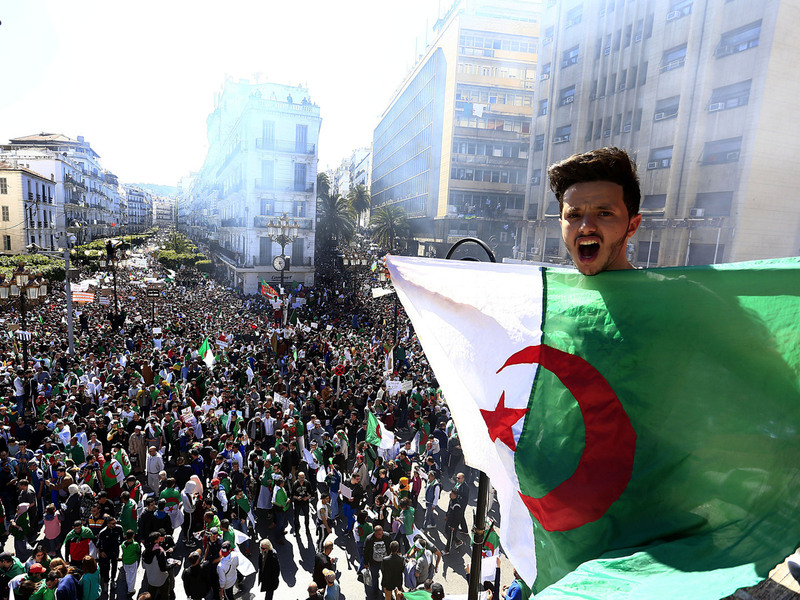 Algerian shouts as he holds the national flag during a protest in Algiers, Algeria, on Friday. As the largely peaceful demonstrations have gained momentum, Algerians have made wide-ranging demands for jobs, an end to corruption and a completely new government. Maher Mezahi, a freelance journalist in Algiers, says protesters don't trust the current regime to oversee the transitional government. "People are saying, we don't need you anymore," he tells NPR. "It's time to pass the mantle on to the younger generation." Mezahi says protesters also called for the octogenarian's "clan" to step down. As NPR's Eleanor Beardsley has reported, "Bouteflika is supported by a group of military generals and top businessmen referred to as The Clan, who are accused of enriching themselves on Algeria's large oil and gas reserves." Mezahi says Bouteflika's government has attempted to make the transition more palatable to the demonstrators, many of whom are decades younger than the country's leaders. In a message published by the Algeria Press Service, Bouteflika announced the creation of an "Inclusive and Independent National Conference" that would be tasked with setting a new election date and drafting a new constitution — and should "strive to complete its mandate by the end of 2019." He also said the committee would be "equitably representative of the Algerian society." Protesters march in Algiers, Algeria, on Friday against President Abdelaziz Bouteflika. And at a press conference on Thursday, Noureddine Bedoui, recently appointed as prime minister by Bouteflika, said that a transitional government would be in place next week. "We have understood the message from Algerian youth in the protests," Bedoui, the former interior minister, is quoted as saying by The Associated Press. "We will from now on commit ourselves to responding." But the massive crowds on the streets of Algiers suggest that protesters aren't convinced by what they see as just a reshuffling within the government. "The people asked for an election without Bouteflika," Meriem Amellal, a journalist with France 24, told NPR earlier this week. "And they got Bouteflika without an election. It's kind of like prolonging a soccer game, but the people say game over."